Exposure to radiation, especially at high levels, causes microscopic damage to living tissue that can result in burns, radiation sickness, and an elevated risk of cancer. People at risk of radiation exposure include hospital and clinic workers, and those who work in facilities where radioactive materials are stored. To prevent these health hazards, lead bricks and other shielding products are used to prevent exposure to the harmful effects of radiation. Lead bricks have a high molecular density that make them highly effective at providing protection from gamma rays, x-rays and other forms of nuclear radiation. When radiation tries to penetrate the smooth, non-porous surface of a lead brick, the electrons are absorbed, and the energy is scattered. 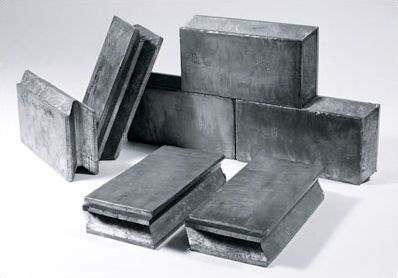 Lead bricks provide a higher level of shielding than lead lined plywood or lead lined drywall, making them ideal for the construction of temporary or permanent walls, partitions and other protective barriers in nuclear and radiation therapy applications. They can also be used for radioactive isotope creation, ballast weights and counterbalances. Our interlocking lead bricks are available in a variety of sizes to suit various shielding and weight requirements and our standard lead bricks can be cut to any size for complete customization. View our Lead Brick Submittals & CAD Drawings for additional product specs or contact us to learn more about using lead bricks for radiation shielding. Radiation Protection Products uses only the purest lead available for our standard and interlocking lead bricks. Absolutely no refining takes place at our facility, making us one of the cleanest, most environmentally friendly radiation shielding providers in the industry. Ensuring you have the right level of radiation protection involves factors including exposure time, distance from the radiation source, and the configuration of your room. Always consult with a licensed physicist to determine the level of protection required and how many lead bricks are needed to provide sufficient room coverage. View our lead shielding considerations for additional information about lead shielding requirements. Interlocking lead bricks feature a tongue and groove design that allows them to be fitted into a variety of forms to create a customized protection barrier. They are a perfect solution for high radiation potential because the interlocking design helps eliminate any radiation leakage in the wall. Our interlocking lead bricks for radiation shielding are offered in sizes that are manageable and easy to stack, and they require no mortar or any other additional shielding materials. • 3/4" x 4" x 12"
• 1" x 4" x 12"
• 1-1/2" x 4" x 12"
• 2" x 4" x 8"
• 2" x 4" x 12"
• 2-1/2" x 4" x 12"
All our interlocking lead bricks meet or exceed the federal specification QQL-171 Grade C.
Standard lead bricks have a traditional brick shape with a straight edge. They provide a high level of radiation protection and can be cut to any length or thickness for complete customization based on your shielding requirements. To prevent radiation leakage, standard lead bricks should be used with lead mortar or stacked in double rows with a staggered pattern to prevent radiation from leaking through the cracks. They can also be used with lead lined drywall or other shielding materials for an increased level of radiation protection. When installing lead bricks, the best method of installation is to have the bricks sandwiched between two rows of studs or steel tubing, or between a concrete wall and a row of studs. Installation of the lead bricks using this sandwich method enables conduit and cabling to be run without concern for cutting through the lead brick wall. In all cases, the design of the lead brick wall should not allow for any penetrations in the wall as this causes issues logistically, financially and with safety. RPP's well-seasoned staff is ready to answer any questions and assist with designs and budgets. We provide our customers with turnkey shielding solutions including installation of lead bricks anywhere in the world. Request a quote for lead bricks or contact Radiation Protection Products to learn more about our radiation shielded windows and other products.